The federal government, television station engineers and viewers who do not have cable or pay TV have spent more than a year gearing up for the big switch. Analog television sets receiving free TV using an antenna will not work after Thursday, but there is help. In addition to a slew of Web sites, the Federal Communications Commission has a call center in Honolulu and a representative on the Big Island to assist with the transition. For viewers who wish to continue using their analog TV sets, the federal government has created the TV Converter Box Coupon Program. 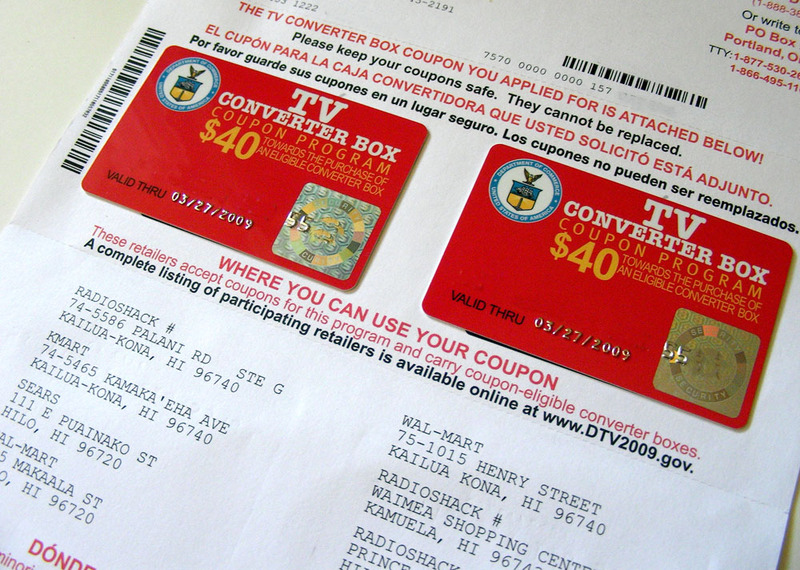 The program allows U.S. households to obtain up to two coupons, each worth $40 to be applied to the cost of eligible converter boxes which are cost $40-$70. Consumers must submit an application to receive the coupons. Converter boxes plug into TV sets, either in the back or front, depending on your TV. You will still need your antenna, which works with the TV converter box. “You should go ahead and hook up your converter box today – just to make sure you know how it works. There aren’t a lot of digital signals to catch yet – KLEI over in Kona as well as most of the stations in Hilo, although those stations aren’t up to full power,” Prime said. After the big switch at noon, “people will have to take action to make their converter box rescan for the new digital channels that go on the air; this isn’t something that happens automatically,” he said. Prime said a series of consumer clinics is planned to answer questions and help trouble-shoot. “We want to make sure that there are in-person resources – places where people who have questions about how to hook up their converter boxes or want to talk to a person face-to-face can stop by for help,” Prime said. More than 50,000 requests for digital converter coupons have been logged in Hawaii. Hawaii has approximately 424,000 television households; more than 20,000 – including nearly 5,000 on the Big Island – use rabbit ears or rooftop antenna. Nationwide, more than 20 million households have a television set receiving over-the-air signals. About 13.5 million of these households rely on over-the-air broadcast to receive their TV programs while another 9 million households have cable and satellite service, but also have at least one broadcast-only television set in the house. The transition to digital TV, which is mandated by Congress, is set for Feb. 17 for the rest of the country. Hawaii is making the conversion early to so building new TV towers on Maui’s Haleakala doesn’t disturb the endangered Hawaiian petrel, which typically nests in February. Inouye said the digital transition will bring consumers better pictures with sharper sound while at the same time freeing up new airwaves to improve communications for emergency first responders.